After dinner, I decided to walk around with the kids a bit while Dave settled the bill and got the car. We walked the few blocks to the local firehouse. It was chilly, and the kids were super curious where we were heading, but once we got to the corner, they saw it. Claire loves firetrucks as much as any four-year old girl does, but Ben? Ben holds a special place in his toddler heart for "woo-woos" and most especially, "woo-woo-guys." As we walked up, one of the firefighters ran into the office and got two coloring books and plastic helmets for the kids, "Hey guys!" we were greeted. "What are your names? How old are you?" Claire was sort of starstruck, and Ben was in awe. Shortly after we arrived, the truck in the right bay had to go out on a call, so we moved out of the way. I thought that was going to be it, but the remaining firefighter (Joe Napolitano) stayed around to show us the other truck (the big ladder truck) He helped both Ben and Claire into the cab, and showed them which button to push to turn on the lights. Then he brought Claire around to the other side and showed her the radio and the GPS computer. He took out his helmet and let the kids touch it. He was so friendly and accommodating, patient and kind, I was really touched. 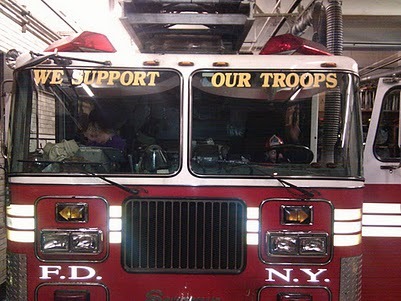 I know the FDNY is always good to the neighborhood, but this was outstanding. On the way home Claire decided that she didn't want to be a ballerina any more. That is awesome!! I love it. It is so sweet that they were so accommodating. And the pic is precious. nice! I love the little hat peeking up over the steering wheel..